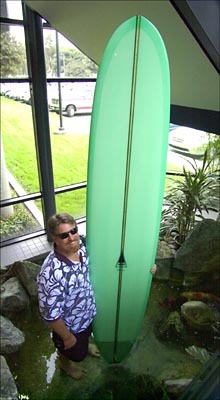 Sports Illustrated's Robert Beck brought his new surfboard to the Luau. 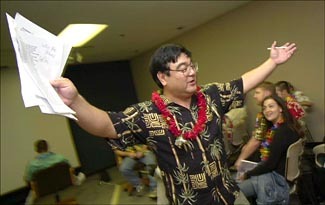 The first Sports Shooter Workshop & Luau was declared "a winner" by organizer Robert Hanashiro. Sixty students and college instructors attended the first-ever event staged by the monthly "Sports Shooter" newsletter and hosted by Nikon at their Torrance, CA. offices on Nov. 10, 2001. "Wow! That's an event that people will remember for a long time to come," commented Greg Lewis, a photojournalism professor from California State University, Fresno. Featuring Sports Illustrated's V.J. Lovero and the Seattle Times' Rod Mar as its main speakers, the workshop had students attend from as far away as Missouri, Texas, Colorado and Washington. "We decided that we wanted a workshop that not only had photographers that would inspire the students with their great images," Hanashiro said, "But we also wanted to have some hands-on instruction as well. That's why we had people like Rick Rickman talk about the business aspect of photography and Robert Seale from the Sporting News lead a workshop on portraits and lighting." "My jaw was dropped the entire day just listening to and seeing the talent put together for us," said Brooks Institute of Photography student Greg Haerling. Other breakout sessions were conducted by the Associated Press' Mark Terrill on using remotely triggered cameras and wireless computer technology; Joe Gosen from the Brooks Institute of Photography lead a class on Photoshop techniques and Alan Greth the director of photography at the Contra Costa Times, Chris Carlson from the Orange County Register and Sam Mircovich from WireImage discussed assembling a portfolio and editing. "The workshop was very informative and inspirational," added Alvarez Wortham a student from Santa Monica College. Robert Hanashiro addresses the students at the workshop. A panel discussion moderated by SI's Robert Beck dealt with the essentials for covering baseball, basketball and football and featured Brad Mangin, Seale and Mar. "I was honored to be there," said Bonnie Burrow the president of the Greater Los Angeles Press Photographers' Association, "Even an old dog can still learn a few new tricks, so it was very helpful to me as well." The Sports Shooter Workshop & Luau was the brainchild of Robert Hanashiro, a staff photographer at USA TODAY, Brad Mangin a freelance photographer based in the Bay Area and Ronal Taniwaki from Nikon. Hanashiro in his spare time produces the monthly "Sports Shooter" newsletter that is e-mailed to over 5,000 photographers and picture editors.